Note: pontoon boat seats must be supported against railing. Classic pontoon furniture uses superior quality materials in a more affordable style. Our pontoon seats will last! The quality of your vinyl and foam won't matter if your seams tear or rot that's why we only use the best UV and mildew treated polyester thread. Each foam pontoon boat seat cushion is built with a mix of soft & dense foam to give you support and comfort where it matters most. Seat bases with molded drain channels increase the life of your pontoon flooring by allowing water to escape your deck instead of being trapped and left to soak into your carpet and decking. No wood! Enclosed plastic seat bases for storage and high impact plastic seat cushion frames will never rot or break. DeckMate® pontoon furniture has a lifetime warranty on all frame parts. Our success is tied directly to our ability to provide good customer service. If your pontoon boat furniture arrives with any defects or quality issues we will pay to return and replace your seating immediately. Simply contact us and we will take care of everything. Industry leading warranty - 3 year full replacement of any defective pontoon furniture. Our success is tied directly to our ability to provide you with quality products and the best customer service. Quality and excellent service are our top priority! Industry leading warranty - 3 year full replacement on any defective pontoon furniture. No other pontoon boat seat manufacturer offers this level of service because no other manufacturer uses the same quality of materials. If your pontoon boat furniture arrives with any defects or quality issues, we will pay to return and replace your pontoon boat seats immediately. We pay all costs associated with any damaged or defective seating. There is never any cost to you. 100% transferable warranty - if you sell your pontoon boat, the buyer is covered. If you're a second owner, just provide us with the original owner's name or order number. You're making a big investment with your time and money when you choose to restore a pontoon boat. Making sure all of our customers know we will support them after the sale is important to us. We will take care of any problems you have quickly and at no cost to you, as we personally warranty everything we sell. PontoonStuff® was founded on the idea that rebuilding a pontoon boat should be affordable and that you shouldn't need a payment to get that new boat feeling. With factory-grade pontoon furniture, flooring, and parts, we make it affordable to have a great-looking pontoon boat again! We've been in business since 2005, and have helped over 200,000 customers fix up their pontoons. We sell to an average of 35,000 new customers per year. We sell more replacement pontoon boat seats than all other marine retailers combined, and focus on offering everything you need for your pontoon restoration. Designing, building, and selling our pontoon boat seats directly gives us a big advantage: We can invest more in quality because we control the entire process. All products are stocked and shipped from our facilities in Elkhart, IN and Dalton, GA.
Before building our own DeckMate brand of pontoon furniture in 2012, we sold nearly every brand of replacement pontoon seating, so we understand what makes a high-quality seat. Because of our experience with other seat brands, we knew where to focus our efforts in order to offer superior quality pontoon boat seats. These pontoon boat seats make up our Premium CFG83A pontoon furniture set. 1 – Insert stud bolts (E) into the T-Nuts located in the black plastic bar on the bottom of the Back Rest Cushion. 2 – Place the Back Rest within the designated spaces and secure and tighten the 1” Washers © with the Wing Nuts (B) from the inside of the base. 3 – Align hinges attached to the Seat Cushion with the inserts located on the front of the base. Click the Ask a Question button. Can you make seats with solid covers, no designs. Such as white or gray. Unfortunately, we do not offer custom color of our Pontoon Seating. If you are looking to recover exsisting seating, we do offer our 30oz marine grade vinyl separately. 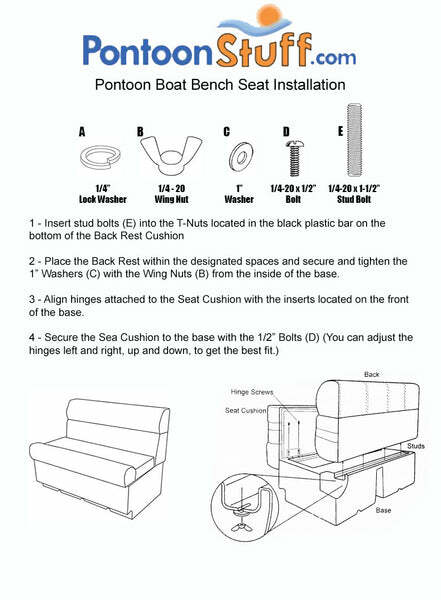 Yes, our pontoon corner seats will actually fit your model Godfrey Sanpan pontoon boat from 1987. Our standard 28" corner pontoon seats are fairly universal on the older model pontoon boats. They may not be an exact perfect fit but they will fit into your railing without any problems. This package is 83" wide, 27" in depth.